A good and rare set of six original Arts & Crafts period, oak framed nursery chromolithographic prints after John Hassall, with facsimile signature. Comprising, Little Jack Horner, Little Tom Tucker, Little Boy Blue, Little Bo Peep, Little Miss Muffett and Simple Simon (who was probably little as well)! c1900. John Hassall RI RMS (1868-1948); painter and illustrator. Studied art in Antwerp and Paris, influenced by the poster artist Alphonse Mucha. Worked as an advertising artist for David Allen & Sons from 1895; a career that lasted some 50 years, in which he produced his iconic “Skegness is so Bracing” poster in 1908. Used flat colours enclosed by bold black lines, a poster style that was equally suitable for picture books. 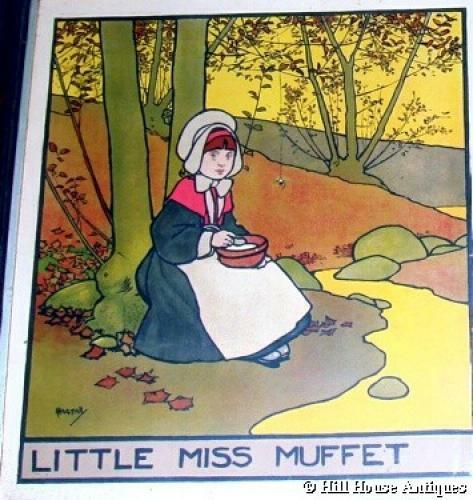 He produced many delightful volumes of nursery rhymes and fairy stories, such as Mother Gooses Nursery Rhymes (1909). Also supplied Liberty & Co, amongst others, with nursery posters and friezes, including the famous “Morning, Noon & Night” posters. In 1900, he opened his own New Art School and School of Poster Design in Kensington, which was amalgamated in 1908 with Frank Brangwyns London School, but was closed at the outbreak of the First World War. In the post war period, he ran his very successful John Hassall Correspondence School.